For most of World War II, 1939-45, Germany’s armored forces or Panzerwaffe ruled the battlefields of Europe through superior tactics, training, and will power. Their primary function was to break through enemy lines along a narrow front “hitting with fist and not feeling with the fingers,” encircle the enemy, cutting him off, and setting up their subsequent annihilation by regular infantry and artillery units. Speed and shock were the Panzerwaffe’s friends. In 1935, the first four Panzer divisions were formed and developed under the watchful eyes of officers such as Heinz Guderian, Ewald von Kleist, Erich Höpner, and Hermann Hoth. By 1939, on the eve of the war with Poland, Das Deutsches Panzerwaffe (German Armored Forces) had grown into ten divisions, spearheading the German assault into several surrounding countries. 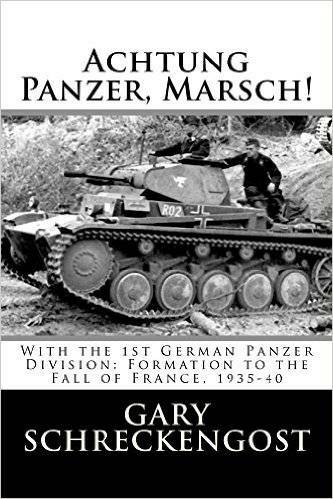 This is the historically accurate but fictional story of Gunter Prehm, a young Saxon who joined Panzer Division 1 in 1935. 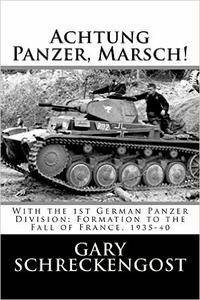 Read what training and life was like for him and his buddies in Kompanie 5, Panzer Reglement 1, about their uniforms and equipment, about the Panzerkampfwagons (armored fighting vehicles—tanks) that they operated and lived in, about the new Panzer tactics that they learned, practiced, and honed, and about their first campaigns in Poland in 1939 and in France in 1940, which proved to the world the decisive punch of revolutionary Panzer division concept, elevating the Panzerwaffe to become the undisputed champions of the battlefield.